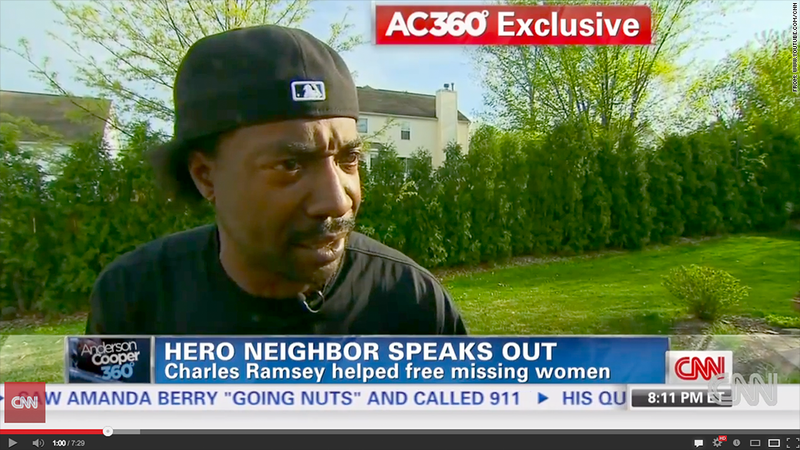 Charles Ramsey will get free McDonald's for a year and gratis burgers from local Ohio restaurants for life. One hero's reward, coming right up. Charles Ramsey, who helped rescue the three Cleveland women held captive by Ariel Castro, will get free McDonald's from his local fast food favorite for the next year, a McDonald's spokeswoman said. The big burger gift comes after Ramsey repeated, in interview after interview, that he had gone to McDonald's before rescuing the women and rushed to their aid carrying a "half-eaten Big Mac." The fast food company also donated $10,000 to the National Center for Missing and Exploited Children in the names of Amanda Berry, Gina DeJesus and Michele Knight, the three women who were held hostage for years. Thousands of people took to Twitter in the days after the rescue, urging McDonald's (MCD) to respond to Ramsey's Big Mac close-up. "Free burgers for life!" one man tweeted. "It was the best advert you could get -- Heroes eat Big Macs," another wrote." Others called for him to star in a commercial and become the next Ronald McDonald. McDonald's was so inundated with suggestions that the company felt compelled to respond, Danya Proud, a McDonald's spokeswoman, said at the time. But for weeks, McDonald's was quiet regarding whether it had contacted Ramsey. Proud said it was out of respect for the victims and their families. At the same time, court documents surfaced that detailed Ramsey's run-ins with the law, including convictions for domestic violence, burglary and drug abuse. His last offense was in 2003. Restaurants are still lauding him as a hero, and making sure he won't go hungry after his year-long McDonald's binge. 14 local Ohio restaurants announced they'll also give him free burgers -- for life. All he has to do is flash his 'Chuck Card,' a lifetime pass printed just for him, at participating restaurants and he's guaranteed the gratis ground beef. Hodges, a restaurant in downtown Cleveland where Ramsey happens to work as a dishwasher, is going even further. The restaurant is now offering the Ramsey Burger, modeled after the Big Mac. Hodges manager Nate Gosselin said they sold 50 Ramsey Burgers the first day they were offered two weeks ago. The restaurant usually sells 20 burgers a day, total. "It's been wildly popular," he said. "It's even on our permanent new menu now." Gosselin said that partnering with the other restaurants to give Ramsey free burgers was a no-brainer. "It was a really great gesture and something that we want to recognize him for," he said. Scott Kuhn, a partner in Driftwood Restaurant Group, which owns Hodges and five other participating restaurants, said Ramsey has yet to pick up his Chuck Card, since he is out of town. Attempts to contact Ramsey were unsuccessful.